Members of repressive societies are forbidden to write about the forbidden; censorship blossoms in the name of morality. But ingenious writers and artists make their way around prohibitions. Even in the most conservative environment, sin can be explored in popular culture if the writer is lamenting the horrid effects of such behavior. Lost virginity and illicit drugs could be the titillating subjects of early films — if they were deplored rather than celebrated. Girls, don’t sell your beauty and be sure not to mate with age! Forward to two late-Twenties songs, music that motivated my meditations on bad girls who wear cosmetics. “Glad rags” become “sad rags” in a day; the brightly dressed young woman will never find a proper husband “to grow old and grey with,” and her many admirers will desert her — although she can always “amend” her flashy ways. Presumably the speaker is sedately dressed and long married — neither a boy who “plays” nor a “pretty little toy the boys like to play with” any longer. Respectable for sure, not aimed for disgrace or disappointment, but the painted woman seems to be having more fun, even if it is transitory. 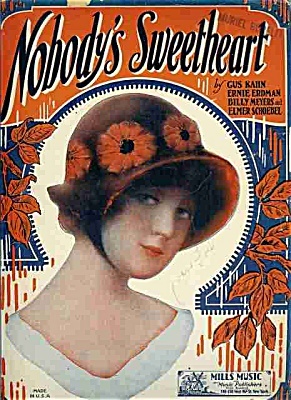 Another song in the same moral mode is NOBODY’S SWEETHEART, which most of us know as a Chicago hot number. 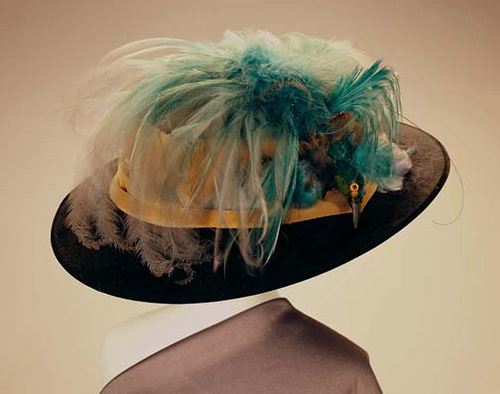 But its initial versions had the same warning coloration: the young woman, in this case, has left all her loyal small-town admirers behind for a shady life of glamor in the big city. Music by Billy Meyers and Elmer Schoebel, lyrics by Gus Kahn and Ernie Erdman. Here’s the sad verse: “You were ev’rybody’s sweetheart / Not so long ago / And in our home town, each boy around / Longed to be your beau / But things are diff’rent today / I’m mighty sorry to say.” Urban fashion seems to require a loss of purity, in a dichotomy. Either small-town sweetheart or Painted Woman Wearing A Bird of Paradise. It echoes Frank Norris and Theodore Dreiser: the young woman who leaves her home for the big city will be changed irrevocably — exiled, outcast. 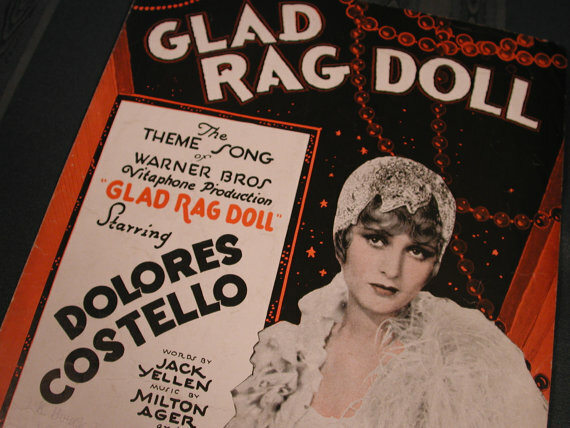 Neither GLAD RAG DOLL nor NOBODY’S SWEETHEART suggests that the young woman has earned her clothing and jewelry through prostitution, but there seems no moral way for a single woman to earn her keep without a husband, so the worst suspicions are never contradicted. But she is beautifully and glamorously dressed. Vice doesn’t endure but it certainly looks good in the short run. 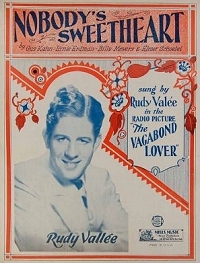 And for those who might not have seen this 1929 short film, it contains a very swinging vocal by a young man from the heartland who would later say that his singing had always been an error. He sounds pretty good here! In theory, Hardy was writing about the hard life of the country maiden, but it seems difficult to take that as the message of THE RUINED MAID, which makes being ruined a delightful version of upward social mobility. A Moral? Live fast, paint your face, leave home for the city, and you’ll be the subject of popular art. That’s Hal Smith, drums; Clint Baker, string bass; Katie Cavera, guitar; Carl Sonny Leyland, piano; Anita Thomas, clarinet; Kim Cusack, clarinet and vocal. Uncredited appearance of a Recalcitrant Microphone Stand courtesy of the local Musicians’ Union. The wonderful Czech writer Josef Skvorecky, who writes both hilariously and sensitively of living between Nazism and Socialism in the Forties, would call this music “Bob Crosby Dixieland.” That would be a high compliment. You might describe it as “New Orleans, “Condon-style,” or “Dixieland,” but the labels are too small for the superb music created by Duke Heitger, trumpet; Randy Reinhart, cornet; Dan Levinson, reeds; Bob Havens, trombone; Rossano Sportiello, piano; Frank Tate, bass; Arnie Kinsella, drums. Here are four sterling “good old good ones,” and if their pedigrees are slightly scattered — from Memphis to Twenties pop, from a song created in the Forties for Louis and Billie, to a hit record for the ODJB (a piece of hot zoology that Jelly Roll Morton said he created) — it all swings marvelously. And there’s the great bonus of a touching vocal from Duke on DO YOU KNOW WHAT IT MEANS — he looks terribly embarrassed when someone points it out, but he’s a great singer. What a terrible movie NEW ORLEANS was! But it gave us this paean to the Crescent City, DO YOU KNOW WHAT IT MEANS TO MISS NEW ORLEANS? Norman Field is a man of many talents. He’s a wildly versatile reed player — capable of becoming hot in the best Teschmacher manner or serene a la Trumbauer — while always retaining his own identity. And he’s a wonderfully erudite jazz scholar, ready to discourse on esoterica — alternate takes and label colors — at the drop of an acetate. Norman’s also an engaging raconteur and enthusiastic singer: the session has new energy when he’s onstage! But that’s only one small sliver of what interests our Mr. Field: see http://www.normanfield.com/hobby.htm for a larger sample, including investigations of obscure recording artists, Norman’s beautiful wildlife photographs, disquisitions on an againg tumble dryer, and more. But what we’re concerned with at the moment is a delightful set Norman and friends created at the 2010 Whitley Bay International Jazz Festival — an ad hoc group named by festival director “Norman Field’s Novelty Recording Orchestra.” I was recording it, and although many of the songs were familiar jazz classics, every performance had its own novelty. The group — a compact assemblage of individualists — included the eminent Nick Ward on percussion, Frans Sjostrom on bass saxophone, Jacob Ullberger on banjo and guitar, Paul Munnery on trombone, and Andy Woon on cornet. Here they are! What could be more wholesome than a nice BLUES (IN G)? And a closing romp on NOBODY’S SWEETHEART NOW made us all elated, notwithstanding the lyric. Has anyone considered that the unnamed young woman of the song is really one of Thomas Hardy’s “ruined women,” who’s much happier having lost her innocence and gained her independence? Thanks for the cheer, O Norman Field and Novelty Recording Orchestra!